Western Honey bees, also referred to as European Honey bees, are considered some of the most beneficial bugs in the world. They pollinate flowers and crops throughout the world and also create sweet honey. Honey is made when bees regurgitate nectar adding an enzyme that helps speed along the honey-making process. The precious honey bee isn’t even from the United States; it was introduced from Europe and has now created a billion-dollar industry in the U.S.
Honey bees are hairy and a combination of black and yellow, with a banded abdomen. These bees are social bugs, meaning they gather in large numbers to create enormous colonies; a typical colony can have anywhere from 20,000 to 90,000 individuals. Within the colony there are three castes of workers; the queen, the drones, and the workers. The queen is responsible for laying eggs. The drones are the males that just mate with the queen. Worker bees are sterile females responsible for feeding the colony. Honey bees are great fliers and even keep their hives cool by simply flapping their wings. They are a passive, docile bee that does not seek you out; because once a honey bee stings you it will die. Their cousins, the Africanized Honey bee are quite the opposite and very aggressive. They look identical and only science can be used to determine their physical and chemical differences. 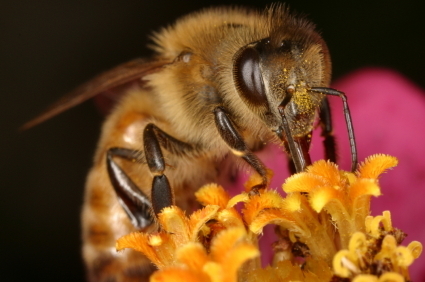 The honey bee is responsible for so many good things in the field of agriculture. Not only does it produce honey, but also beeswax, pollen, and royal jelly. So when you spot a nice, quaint honey bee, be sure not to swat it!